"Being the soul’s breath, prayer is most important in the life of a Christian. The presence of prayer in one’s life means that the person is spiritually alive; without a prayer he is dead"
How one can enter a prayerful state of mind. Being the soul’s breath, prayer is most important in the life of a Christian. The presence of prayer in one’s life means that the person is spiritually alive; without a prayer he is dead. Standing in front of icons and bowing is not yet prayer itself—those are only attributes of prayer. The same can be said about reading a prayer: whether recited by memory or read from a book, it would be not prayer itself, but merely a way to begin. The main thing in praying is the invocation of feelings of reverence for God: devotedness to the Father, gratitude, submission to the will of God, an aspiration to glorify Him and similar feelings. That is why while praying we should make those feelings permeate us so that our hearts would not be dry. It is only when our hearts appeal to God that reading prayers (evening or morning praying) becomes true prayer; otherwise it is not yet prayer. A prayer, which is an appeal of our heart to God, should be invoked and strengthened; a spirit of intercession should be brought forth within us. The first way to do this is to pray by reading or listening to prayers written in prayer books. Read the prayer book or listen to it very attentively and you will definitely incite and strengthen your heart in its ascension to God, which means you would enter into a prayerful spirit. 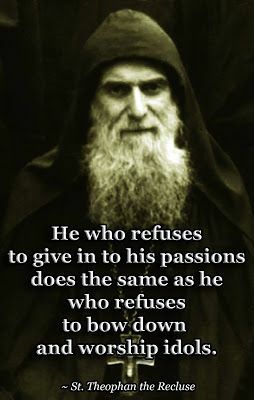 In the prayers of the holy fathers (printed in prayer books and other church books), a great power of prayer is in motion. Whoever diligently pays attention to them will through this force of interaction delight in that power, as the state of mind of the person praying comes closer to the essence of those prayers. In order to turn your intercessions into an effective way of cultivating prayer, you must make it so that both your mind and heart would perceive the content of the prayers being read. 1. Do not start a prayer without preparing yourself for it properly. 2. Say prayers with feeling and attention, but not casually. 3. After completing your prayer, do not hasten to go back to your everyday cares. Before you start a prayer, no matter where it might be, stand or sit for a short time and try to sober your mind, relieving it of all irrelevant work and cares. Then give thought to the One to Whom you are turning in prayer, and who you are in praying to Him; invoke the appropriate attitude of humility and reverential awe for God. That is the beginning of a prayer, and a good beginning is half the success. Having prepared yourself, stand in front of the icons, make a sign of cross, bow and begin the usual prayers. Say the prayer without haste, discerning every word and taking it close to your heart. In other words, you should understand what you are reading and feel what you understood. Cross yourself and make and bows while praying. This is the essence of reading prayers that are fruitful and God pleasing. For example, when reading, "Cleanse us from all impurity", you should feel how impure you are; desire the cleansing and with hope ask the Lord for it. Saying, "Thy will be done", commend your destiny to the Lord completely and wholeheartedly, with readiness to accept gladly whatever He sends you. While reading "And forgive us our debts as we forgive our debtors," your soul should forgive everyone who offended you. First, set a specific praying rule for yourself. It should not be too lengthy, so that you might be able to fulfill it without haste amidst your daily routine. Second, in your spare time read through the prayers of your set of prayers (prayer rule) attentively, understanding and perceiving every word so that you can prepare yourself beforehand and learn what feeling and thoughts you need to evoke in your soul to understand and perceive everything easily during your prayers. Third, if other things distract your volatile thoughts during your prayer, exert yourself to focus your attention, keeping your mind concentrated on the subject of your prayer. Bring your mind back to it every time it wanders away. Read the prayer again and again until every word of the prayer is said with awareness and feeling. That will rule out your absent-mindedness during prayers. Fourth, if some word in the prayer touches your soul in a special way, do not proceed with the prayer, but focus on that word or phrase, nourishing your soul with the attention, feeling and thoughts evoked by the word, stick to that state of mind until it fades away. This is a sign of the prayerful spirit beginning to enter you. That state of mind and soul is the most reliable way to cherish and strengthen the prayerful spirit in a person. What to do after the prayer. After finishing your prayer, do not hasten to take up your usual chores, but slow down and think at least for a little while about what you felt and to what it obligates you to do. Try to keep in your mind what impressed you most of all. The nature of the prayer itself is such that after a really good prayer one would not want to switch over to one’s usual things, as those who have relished something sweet do not want anything bitter. Enjoying the sweetness of praying is in fact the goal of saying prayers, which brings up the prayerful spirit. Following those simple rules will soon bring results. Any prayerful invocation makes a good impact on the soul, if you stick to those rules, and it deepens the impact; patience in praying will generate a prayerful mood. Those are the first steps in bringing up a prayerful spirit in oneself! It is for this purpose that the practice of praying is set. Yet, it is not the aim in itself, but just the beginning of gaining mastery in prayer. We have to go on. After your mind and heart get accustomed to turn to God through prayer books, you should try to do it in your own way. Your aim is to make your soul capable of entering, so to speak, into a conversation with the Lord, lifting up your mind and heart and opening up in confession to Him, telling Him what is in your soul and what it needs. We must teach our souls to do this. So what can we do to succeed in mastering this knowledge? The first way is to pray by the book with awe, attention and deep emotion. For it is from the heart filled with devout feelings and prayers that your own prayer will begin to emanate and be addressed to God. But there are also other ways leading to the desired result in prayer. The first way to teach your soul to have frequent recourse to God is the devout contemplation of divine ways and deeds: thinking about God’s mercy, justice, wisdom, creation, and Providence, about His granting us salvation through Christ, about the Grace and the Word of God, about sacred mysteries and heaven. Those thoughts will unfailingly fill your soul with devout awe towards God, which directly turns the whole of the being of a man to God and is hence the direct way to teach your soul to be lifted up to God. Having finished your praying, especially in the morning, sit down and begin thinking about that or this way or deed of God, and try to tune your soul respectively. Join St. Dimity of Rostov, saying, "Visit me, sacred Godly thinking, and we will be absorbed in contemplating great acts of God." This will touch your heart, and your soul will start pouring itself out in a prayer. With little effort you will be able to achieve much. You must only have the will and persistence to do it. For example, beginning to think of God’s Grace will show you that both your spiritual and bodily being is endowed with God’s mercies, and you will fall down before Him overwhelmed with gratitude. Start thinking about God’s omnipresence and you will understand that wherever you are, you are facing God and God is facing you. Then you will be filled with devout awe. Think of the Truth of God and you will become convinced that no bad deed goes without punishment. Then you will certainly decide to cleanse out all your sins through your heart-felt repentance and humility. Begin thinking of God’s omniscience, and you will understand that everything in you is open before God’s eye. Then you will definitely become strict with yourself in everything, so that you would not in any way offend God Who sees everything. The second way to teach your soul to turn to God is based on devoting every deed, large or small, to the glory of God. For, if according to the commandment of the Apostle (1 Cor. 10:31), we make it a rule for ourselves to do everything, even eating and drinking, to the glory of God, then no matter what we are doing we will certainly remember God—and not just remember, but fear to do anything that might anger God. That would make us turn to God with fear and ask Him prayerfully to grant us help and enlightenment. And since we are always doing something, we will constantly turn to Him in prayer and thus almost at all times will we learn the skill of addressing God in prayer. This way we will learn in practice to turn to God more often during the day. The third way to teach our souls to pray is to appeal frequently to God from our hearts during the day, saying short petitions concerning the needs of our souls and the things we are doing at the moment. When beginning to do something, say: "Bless me, O Lord!" 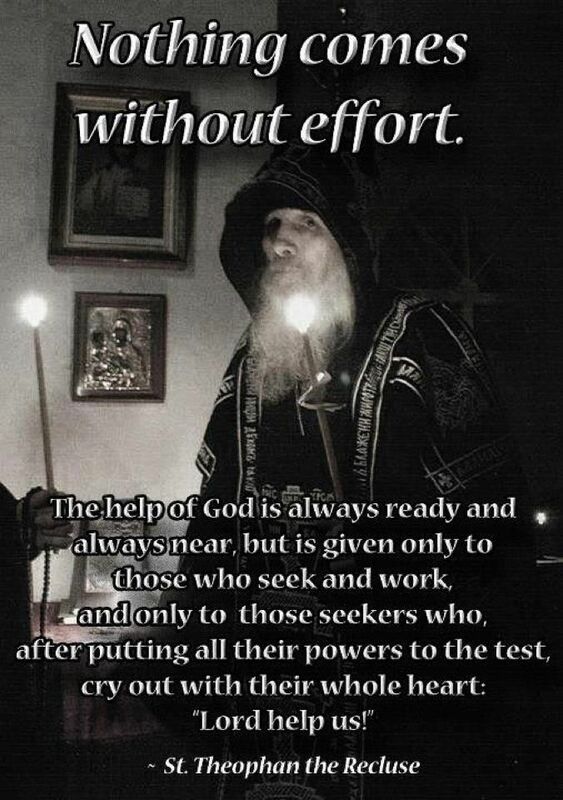 Finishing the work, say: "Glory to Thee, O Lord!" If a passion inflames you, fall down before God in your heart saying the following: "Save me, O Lord, I am perishing!" When overcome with disconcerting thoughts call out: "Lead me by your way, O Lord," or "Do not let my feet go astray." If you are downcast by sin and becoming despondent, cry out as the tax collector: "O, God be merciful to me a sinner!" You should act this way in all situations. Or you can just repeat: "Lord have mercy!" or "Holy Lady Theotokos, save me!" or "Angel of God, my holy guardian, protect me!" Or you can say other similar words, calling on God’s name; you should do it often and try to make the words come from your heart, as if squeezed out of it. When we do that, we will often be lifting our hearts up to God, frequently addressing God, frequently praying—and that translates into the ability to converse intelligently with God. 3. To appeal to God more often with short invocations. After we thoroughly ponder over spiritual ideas in the morning, these sacred thoughts tune us to remember God all day long. Those thoughts in turn will direct all our actions, both external and internal, to the glory of God. Through this procedure our soul may become predisposed to sending up its short, prayerful invocations to God. Those three things—Godly thinking, doing everything to the glory of God, and frequent appeals to Him—are the most effective ways to learn intelligent and heart-felt prayer. Those who practice this will soon master the skill of ascending to God in their hearts. Thus, a soul will begin to enter the sphere of the Sublime, which is inherent to it, through the heart and thoughts in this life, and will truly be allowed to appear before God in the next life.